The SMT team were thrilled with the interest and outcome of our first of many MASTA Training workshops and European User Forum that took place in Munich, Germany. The day long workshops provided a great opportunity for MASTA users to experience a hands on interactive training session. The introduction to the MASTA workshops and first day, led by Dr Tom Harvey, Technical Lead – Software Engineer/Analyst at SMT, explored FE functionalities as well as future developments in the upcoming major software release, MASTA 9. Day two of the training was led by Gareth Cooper, Principal Engineer at SMT who covered NVH capabilities and significant functionality improvements in MASTA. The positive feedback and flux of questions allowed the SMT team to flexibly answer support queries that will aid in the development of many MASTA projects to come. 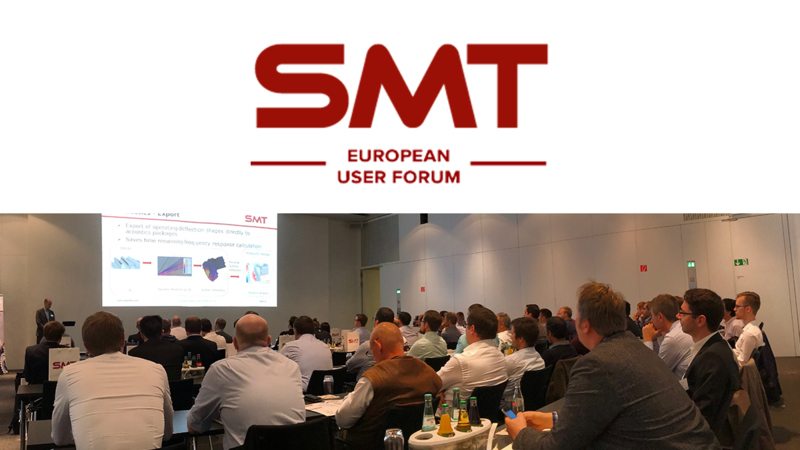 Now in its second year running and the third of User Forums that took place this year, we invited customers across Europe to join the SMT team for the 2018 European User Forum. The forum was a great opportunity for the team to join customers for a preliminary evening of welcome dinner and drinks at the Flemings Hotel. The User Forum itself, held at the BMW Welt in Munich, was a great success and was a day filled of presentations from SMT experts as well as guest presenters from Magna, Schaefller, Daimler and ZG relating their positive use of MASTA. Dr Rob Forrest, Customer Support Manager at SMT comments: “From the start it has been SMT’s wish that our users take centre-stage at these events and so it was a great pleasure to welcome a mix of established and new users to our 2018 event to hear a number of presentations delivered by MASTA users. With a number of opportunities for all attendees to network throughout the day and be involved in the future direction of SMT’s software development, we once again reinforce our commitment to our ongoing company-wide ‘Customer First’ policy whereby we can all achieve success together! In addition, our two interactive workshop events on FE and NVH held either side of the User Forum for the first time this year were judged to be a success and highly beneficial by all who attended. For anyone looking to learn more about our leading CAE software for gearbox and transmission systems, get in touch with us through our contact page.